Saudi Arabia has been a longtime ally of the US. The alliance experienced a hiccup when Saudis bankrolled the 9/11 attacks. Saudi Arabia is a bulwark against our enemy Iran’s efforts to become the dominant power in the Middle East. The murder of journalist Jamal Khashoggi at the Saudi consulate in Istanbul has led to an outcry in Europe and the US with shrill calls for the punishment of the Saudi Kingdom. The CIA has now concluded that Saudi Crown Prince Mohammed bin Salman ordered the killing of Khashoggi. Although the Saudis insist that the Crown Prince had absolutely nothing to do with the journalist’s murder, the CIA is probably right. The critics of Middle Eastern government leaders are often imprisoned or murdered. What makes this case different is that Khashoggi has been living in the US and was a Washington Post columnist. Once the murder came to light, pressure was put on President Trump to punish the Saudis. That pressure is now stronger than ever because of the CIA’s conclusion. So what is Trump supposed to do? Send a secret CIA assassination squad to Saudi Arabia to chop off bin Salman’s head? I say that Trump should condemn the murder in the strongest of terms, but do so without referring to the Crown Prince in any way. That’s all and nothing more! 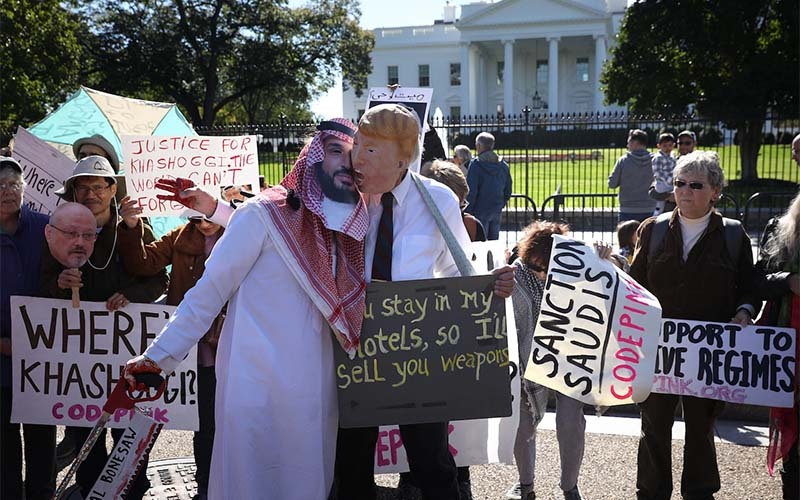 After all, if Khashoggi had not been a journalist, his murder would have caused only a blip in the media and there would have been no calls for the punishment of Saudi Arabia. The enemy of our enemy is our friend. It makes no sense whatsoever to drive a wedge between us and the ally that we depend on in our conflict with Iran. Should we believe the cia? It appears that Kashoggi, “journalist” or not, was doing the bidding of the Muslim Brotherhood. The Saudi Crown Prince has been acting behind the scenes to reduce the influence of the Brotherhood in Saudi policies (such as funding the 9/11 attack). I see Kashoggi’s elimination as a positive step for Saudi foreign policy and would give greater credence to the howls of complaint if a single voice has been raised in protest of the 200+ real journalists who have been slain in Mexico trying to report on narco-terrorists. I agree with you, Howell. Its the Saudi’s problems and how they want to deal with their citizens one way or the other. We need to keep moving on and be more concern about our well being. We need to stay at home and keep developing the growth here. We need to welcome the Saudi’s Prince 450 Billion dollar investment into our tech, oil, machinery contracts along with the building of the Boeing planes. Move on….just like how the Latin Countries move on when we do it to them by interfering in their elections, and kidnaping their citizens in the wee hours of the mornings and flying them back here. Our President Trump is doing just fine. He keeps his nose out of foreign dealing with their own way of lifestyles. I back him. Maybe what we really need to do is find out who let Khashoggi into the US in the first place. If you are known and on record as being a Muslim Brotherhood member or sympathizer, and an Osama bin Ladin pal, you should definitely not be allowed into the US. Who let him in? Why is the WaPo hiring terrorist sympathizers? The even bigger question is, why is the MSM trying to goad Trump into severing ties with MBS? Who wins? Not our arms makers and employees who make a hundred billion dollar sale, and not all the Americans who will be employed with the multi hundred billion dollar Saudi investment in the US. Also not our military, who have a strategic ally against Iran. So who wins by trying to separate Trump from MBS? It isn’t the American people. I agree with Steven Howell and Berna. Good posts.